White House Advisor and would-be National Security Council member Steve Bannon. Photo courtesy of Don Irvine. Among all of the other reasons for alarm about presidential advisor Steve Bannon's role in the White House, one thing is clear: President Trump’s decision to give Bannon a vote on the National Security Council is a dangerous one. 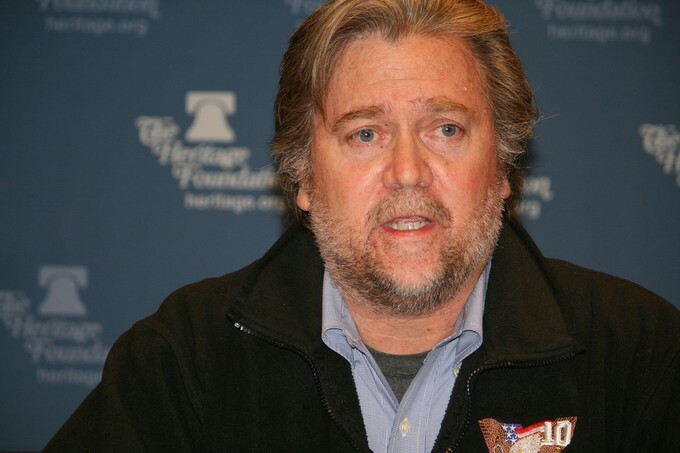 Sign the petition to tell Congress that Steve Bannon does not belong on the National Security Council. No previous president has installed a personal political advisor on the National Security Council. Each president forms his (or maybe her) own National Security Council, and each administration makes some changes to the council. The core members of the NSC – which can only change by legislation – include the president, vice president, secretary of defense, secretary of state, and secretary of energy. Other intelligence, military, and even treasury officials (among others) also participate. But the NSC has never before included a partisan political advisor to the president. Look at our last two presidents: President George W. Bush reportedly banned his political advisor Karl Rove from NSC meetings. And President Barack Obama permitted his political advisor David Axelrod to sit in on meetings, but he did not have a vote – in fact, he didn’t even speak. Every president considers politics when he or she makes national security decisions. That may go without saying. But national security decisions can’t be made based on politics alone, or the results can be disastrous. The need for studied advice and meaningful debate remains, and that’s what the NSC is supposed to do. Even if a president finally makes a political calculation, he or she must know the actual dangers America faces and what the consequences of his or her decision might be. The NSC should be free to provide that advice and information without undue consideration of partisan politics. Retired Admiral Michael Mullen – a former Chairman of the Joint Chiefs of Staff and NSC member under Presidents George W. Bush and Barack Obama – wrote about the importance of keeping Bannon, and all political advisors, off of the National Security Council. Tell Congress that Steve Bannon doesn't belong on the National Security Council.